There is a lot of buzz from time to time about the death of SEO. What does that really mean? Black-hat SEO is dead... long live White-hat SEO! Yes, you can be penalized if you don't do it right. Primarily, SEO means designing your website to help the right people find you. SEO (Search Engine Optimization) has several major parts: planning, on-page, and off-page optimization. Planning means understanding your customer, clearly defining your niche, brand-image, and assessing your competition. Characterize your “customer personas” to understand the different kinds of customers that you want to approach. Competitive analysis helps you to understand your environment. SEO is a key part of online marketing. ON-page SEO means applying good design principles, having a useful layout, and providing unique content with value to real visitors, not only for the search engines. It also means paying attention to your relevant keywords. It's very important to have content on your webpages that provides real value to real users. Using appropriate keywords on your webpages helps the search engines understand the main purposes of your site. To check your title, description, and headings, use the show source option in your web browser. Check for the title tag, description tag, H1 and H2 tags. You should not have more than one H1 and a few H2 tags. The keywords used in those each of those tags should be appropriate, relevant, and useful. The title should not be more than about 65 characters, and the meta-description should not be more than about 160 characters. When these tags have keywords relevant to any search, Google can display your title and description directly in the search result page, so they should be optimized for the best click through relevant to your website and your business. Avoid keyword stuffing, your keyword density should not be over 5% of your text. OFF-page SEO means having some relevant and authoritative links pointing to your webpages from other websites, on other Web servers. Make sure that most of your inbound links are high quality. Disavow any low quality links. Google webmaster tools may provide some warnings for low quality links. Natural linking is important. For example, stuffing random blogs with NOFOLLOW comments will not help, and may harm your search result positions. Social signals (primarily, links and mentions on Google+, Facebook, Twitter, Pinterest, and YouTube) have become more and more important for SEO recently. Social proof (demonstrating you have real followers relevant to your customer base who interact with you online) also provides you with better credibility. Relationships and engagement are very important. SEO will continue to be relevant for Internet marketing, as long as webpages remain relevant. By avoiding black hat SEO techniques, and using only white hat SEO techniques, you will improve your website, get more traffic, and have better results for your web presence in the search engines. Like maintaining a garden, SEO is an ongoing process. Bottom line on the "Death of SEO?" As long as websites want to improve traffic, there will be SEO. However, social signals and paid search engine marketing can be as important as organic SEO. Engagement with your audience is key. Measurement and continuous improvement should be a big part of your SEO. Black-hat SEO is Web-Spam, and anything else that Matt Cutts decides it is. Black-hat SEO is DEAD, long live white-hat SEO. Install Google Analytics (GA) on your website, then use Google Webmaster Tools (GWT) to look for any problems and to measure your results. Make sure to use your Google Places page effectively (formerly called Google Local.) Links on your own YouTube video descriptions are NOFOLLOW but still good for SEO and for Web Traffic. For LOCAL businesses, be sure to use GOOGLE PLACES for Business. 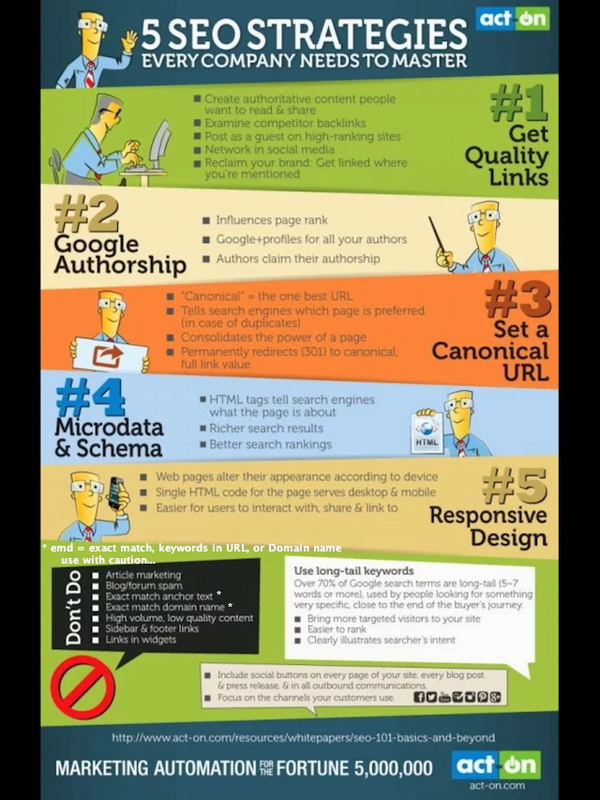 For Blogs or Personal Websites, use GOOGLE AUTHORSHIP. For inbound LINKS? — Put your own LINKS into your YouTube descriptions, your Tweets, your Google+ Posts, your public Facebook posts... etc. etc. etc. — ask your friends to do the same, wherever and whenever that is appropriate. It's like asking for a referral or a testimonial. That covers the basics of the WHAT... for help with the HOW, please contact me for Mentoring, Coaching, Training, or Assistance with your Internet Marketing Stratagy and Tactics. Great info George. I have heard of this hummingbird thing tying SEO to social media activity. Keeps changing every day it seems. What sets me apart, will set you apart. SEO is both art and science. The key is relevant content. And don't expect results overnight. I attribute my real estate success to the proper use of SEO on my site. It's quite powerful when used properly. Interesting that social connections are now becoming more important. Hopefully this AR platform will score highly and help us all. Whehhhh - a whole lotta info in that post. Much of it over my tired head, but I did get some tips form it. It's always a good idea to revisit what works for getting results. Thanks for your time and effort. Great tips. I've been going through a rebuilt and havne't blogged much. I need to get back on the band wagon and do it better. Hi George. Further to your reply #33, indeed marketing is the engine of any business. However, not quantity over quality. Quality of the client is the #1 most effective component of your business. Quantity is not. Generating quantity is relatively easy but the least efficient way of running your business as it wastes precious limited resources like time. Quality is not only efficient in performance, but effective - that's where the income is. i.e I would rather generate much less clients but make each one and every one count, than lots of potential clients but only some of them count - that's the measure of efficiency. Case in point, got a colleague at the office. He's the internet lead king. Unbelievable numbers. He came in this week to tell me is business is down, he can't close most of his leads, but he sure is busy. He wanted to know what to do to turn things around. Thanks for this. Good read, and it's important to stay on top of new SEO practices - since it is always changing. It's good to change hats from time to time. This is a really well written blog. Keep up the god work. I will use this usefull information in the future. Basics of WHITE HAT SEO have not really changed. It's the tricks of Black Hat SEO that have been penalized. Cheaters will not win, thanks to Matt Cutts and the Google Webspam Team. Please note :: More Pro-tips... UPDATED on 6/6/2014 :: see above. Planning to use some of that for a case study.
. . . avoid webspam — avoid keyword abuse. What do you think of writing a new post from your today prospective. What do you think today about CEO? Faire du referencement naturel nécessite des connaissances, des compétences, mais aussi des outils de SEO. Outils-SEO-Logiciel-SEO En effet, pour travailler efficacement et pour pouvoir connaître tout d’un site internet et de ses concurrents, il vous faudra disposer de bons logiciels ou sites internet qui offrent des solutions pour le Search Engines Optimization. Je vais donc vous faire découvrir une petite liste qui pourra vous être bien pratique pour analyser un site ou faire un audit SEO.